Self Cure Remedy details of Apply calendula for the care and relief of Dry Skin, including effectiveness and popularity scores of the remedy. 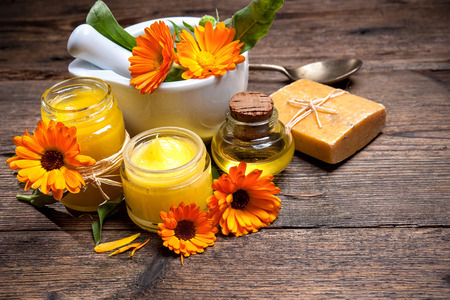 Calendula cream makes an excellent skin salve that soothes and moisturizes at the same time. Apply calendula cream to small dry, flaky patches on the face or body. The self cure remedy of Apply calendula for the care and relief of Dry Skin has a popularity score of 0 on the self-cure system.